Ralph Herbert Weatherford and his wife Vivian Bennett Weatherford opened the doors of Weatherford Mortuary for business in December 1966. Mr. and Mrs. Weatherford were both born and raised in Lake City, TN. Mr. Weatherford served with the United States Air Force during WWII and he and Mrs. Weatherford were married in 1947. Mr. Weatherford graduated from Gupton-Jones Mortuary School in Nashville in 1950, and had worked for funeral homes in Tennessee, North Carolina and Arizona. The Weatherford's had dreamed of opening their own funeral home and after much consideration, they decided on Oak Ridge as the location for their funeral home. In 1967, their oldest son, Bennett Weatherford joined the firm after his graduation from the Kentucky School of Mortuary Science, located in Louisville. In 1978, Mr. Weatherford's health began to decline and he stepped down from the day to day responsibilities and began to serve as a consultant. Bennett's wife, Sandra came to work with the family in 1978. She and Mrs. Weatherford, both received their Funeral Director's licenses in 1982. A daughter, Joy Katz began working with the family firm in 1986. Grandson, Erik Weatherford graduated from Mid-America College of Funeral Sciences in 2003 and immediately joined the firm. In 1995, a major renovation was completed which doubled the size of the original building. 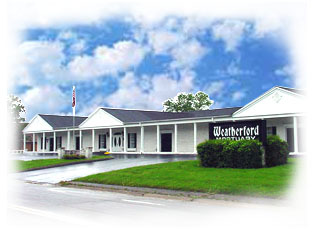 Weatherford Mortuary is a full service funeral home offering traditional services, cremation services and pre-arrangement services.